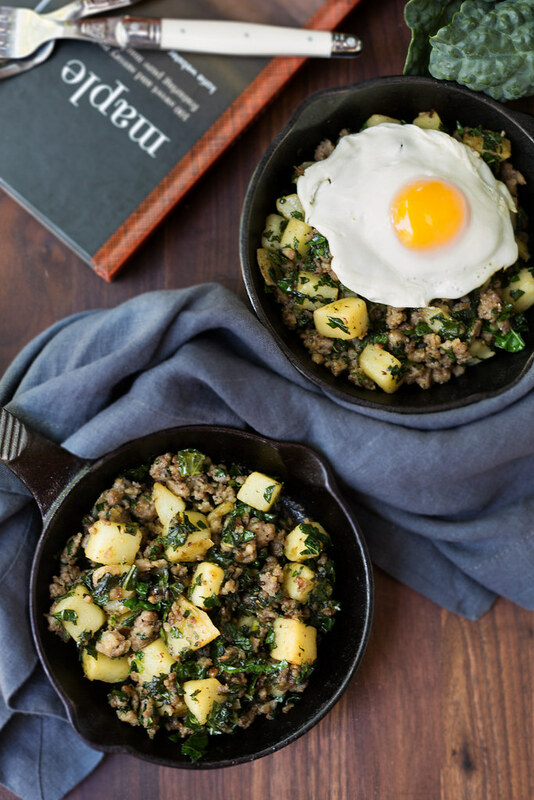 Disclosure: I received a copy of Maple from Quirk Books to review, with permission to excerpt the recipe for this Potato and Sausage Breakfast Skillet. As always, all opinions expressed are my own. Have I mentioned that I’m something of a cookbook fiend? I’m that girl who approaches a new cookbook like a novel. When the weather starts to get cooler, there’s nothing like curling up on the sofa with a cup of something warm and getting lost in a new collection of recipes. I especially love when a book finds new ways to use old favorite ingredients, giving new life to nostalgic flavors. Katie Webster’s Maple does just that. With 100 recipes from cocktails and cakes to salads and chilis, Webster’s creative use of maple syrup takes readers far beyond standard breakfast fare. 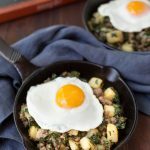 I’ve enjoyed several recipes from the book since its arrival, one of which was this Potato and Sausage Breakfast Skillet with Greens. A hearty twist on a breakfast classic with a hint of sweetness in the background, this skillet would be a nice addition to any breakfast or brunch table. 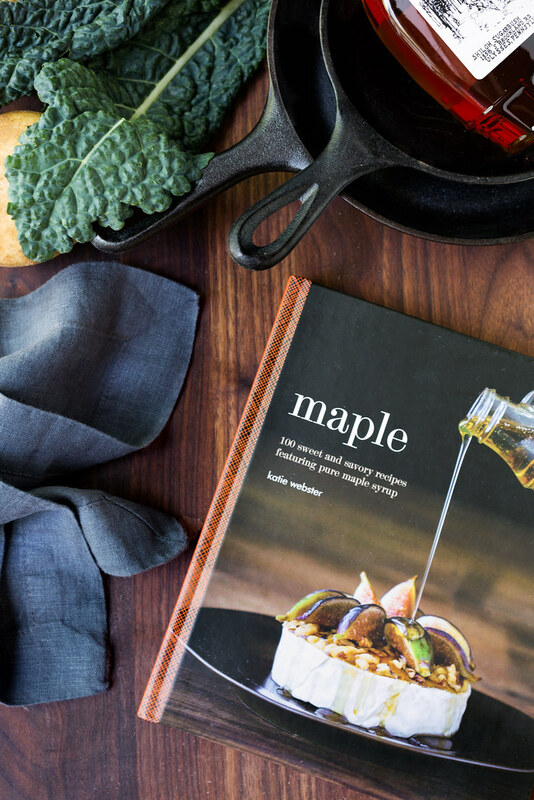 Reading the introduction to Maple, you know you’re about to dive into a heartfelt cookbook. Webster and her husband live in Vermont, where they enjoy “backyard sugaring” as a hobby, tapping trees and processing the sap at home by boiling it into syrup. I can’t say that I’m not a little jealous of this pastime! What an interesting and fun endeavor, not to mention an amazing gift to be able to share with family and friends. In truth, maple syrup is pretty much woven into the fabric of American breakfast culture. Webster writes of her hope that her cookbook will evoke special memories for her readers, and shares some of the charming recollections that maple syrup brings to the forefront of her mind. As a collection, the recipes feel as genuine as they are versatile, spanning not only a range of courses, but also seasons. My mind tends to gravitate toward fall when I think of maple syrup, but with recipes such as Maple Margaritas, Swordfish with Maple Pipérade, and Sweet and Sour Coleslaw, Webster demonstrates how versatile maple syrup can be as an ingredient for year-round use. 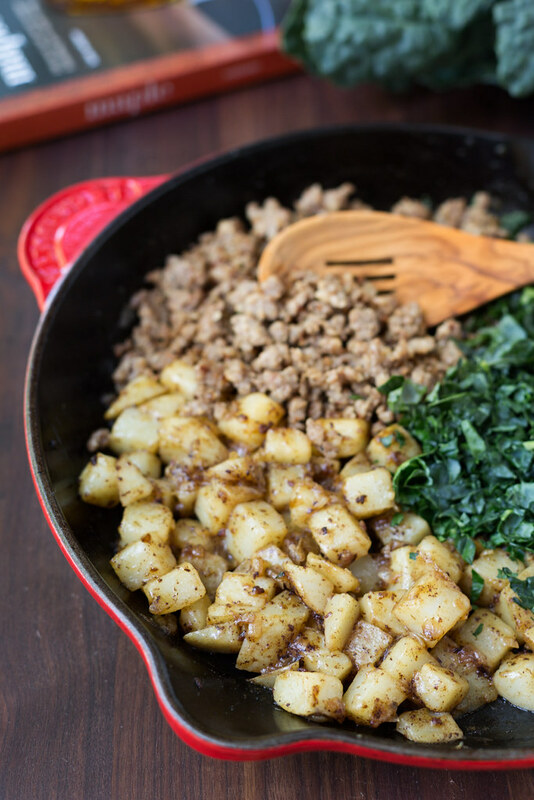 Webster’s breakfast skillet was a nice combination of traditional morning fare—potatoes and sausage—with an addition of kale for a nutritious twist. The maple syrup provided a hint of sweetness that was present, but not overly assertive. The recipe doesn’t specify that the skillet should be served with eggs, but I went for it. 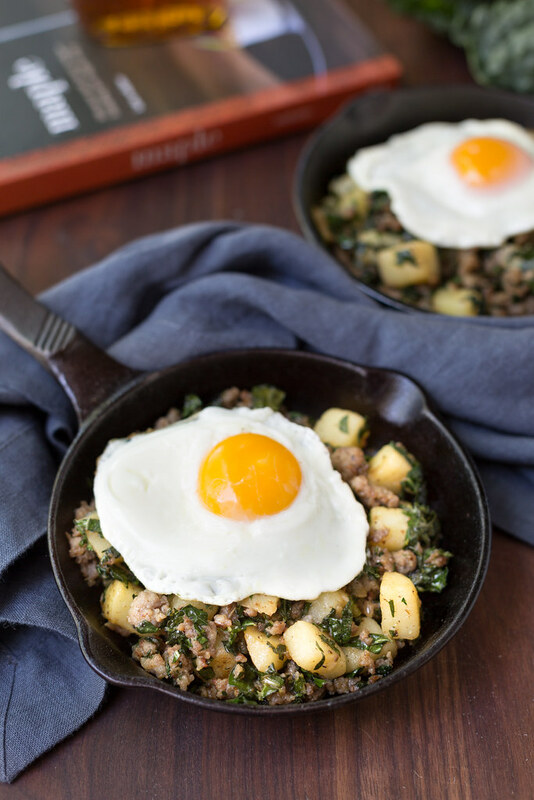 We loved allowing the velvety yolks to mingle with the potatoes, sausage, and kale. It was actually lunch time before I finished the photos the day I made this, but that didn’t stop us from digging in. As Maple so aptly demonstrates, there is no wrong time of day to enjoy one of nature’s best sweeteners! Bring several inches of water to a boil in a large saucepan fitted with a steamer basket. Add potato to the basket and steam 5 to 7 minutes, until just tender when pierced with a fork or the tip of a paring knife. Set aside. Meanwhile, brown sausage in a large nonstick skillet over medium heat, stirring with a wooden spoon and breaking up chunks, 3 to 4 minutes, or until pink is no longer visible. Scrape sausage onto a plate and set aside; cover with foil to keep warm. Add oil in the skillet and return heat to medium-high. Stir in shallot and salt and cook, stirring often, for 30 to 90 seconds, or until fragrant. Add potatoes to shallots and cook, stirring occasionally, for 4 to 6 minutes, or until potatoes are mostly browned. Add sausage and any accumulated juices, kale, syrup, and vinegar, and cook, stirring often, for 2 to 3 minutes, or until the kale is wilted and just tender and sausage is heated through. Season with pepper. Serve warm. I haven’t eaten breakfast yet and this looks delish!!! Thanks for sharing this great idea…love the mini skillets! What an awesome brunch recipe! Love it. I’m so glad I stumbled across this. I was hoping to meet some friends this Friday for a birthday (my birthday) brunch, but that plan fizzled out, so I am seriously thinking about making this for a birthday brunch treat for myself instead. It looks that good! Thanks for sharing, and this whole cookbook sounds excellent! I think serving this skillet with eggs is the best way to do it! :) Looks delicious! This looks so tasty. I would love this for breakfast. I need to check out the cookbook as well. One of my very favorite ways to eat breakfast potatoes is with an egg on top. I love the delicious coating from the yolk and how it elevates the flavor. Combine all that with maple syrup and greens and I can’t imagine a better start to the day! This is a cookbook I’m sure to go check out! Oh my, this is a skillet of goodness! I so need to get me some small skillets like those! I love the idea of maple syrup in this, it is such a great twist! Lovely! I love maple syrup so I will definitely need to check out her book Maple. And these breakfast skillets look super. I love the added kale. Definitely a great breakfast! Wow! These look delicious, and I love breakfast for any meal of the day. I can’t wait make these. I have a huge amount of cookbooks too. I am loving this recipe so it sounds like I have another one to add to my collection. I’m such a hash fan – and this sounds like a wonderful combination — and like you, my idea of reading is going front to back of a new cookbook! This one sounds like a winner! I’ll check it out! These are just perfect! I love skillets for a weekend brunch and these look right up my street!